Aurora Avila has a small following for her unique DJ play list. She DJ/s 6-9 SL time Tuesday, Thursday and Saturday. Saturdays are special as her naked penguin Saturdays. Her song selection consists of remixes of music from various video games and Asian music. It’s an understatement to say she’s unique in SL for her music playlist. I went to her Thursday set and thought what the heck why not interview her again? After all her and DJ sets was the first article I wrote for the SL Newser. Aurora said her first year in SL was very productive as she learned how to build with help from her friends. I asked her how long she has been djing and she answered, "Well, was around the middle of '08 that I started, so right around five years." Aurora Avila: "Well, I had people helping me out. Not that I wasn't a flailing nooblet, but still. You don't build with SL's build menu so much as build in spite of it, finding new and exciting ways to sneak around its limitations. Which sounds terrible, but it's actually pretty rewarding!" Aurora creates stuff at random as she said she was working on building a spaceship. Knowing how she likes Samus Aran I asked is it a starship from Metroid? She answered bigger so I went to the extreme and asked, "Wow something like the starship Enterprise?" Aurora Avila: "Not quite THAT big! Something big enough to need a crew though." Aurora also made a bald eagle avatar that was a challenge for America’s birthday the Fourth of July, "A bit! It was mostly in the concept, though. Once I got the parts to put together to make the avatar, the actual modifying wasn't all that bad." Aurora does make really good things in Second Life as she’s old school when mesh is becoming the new school. I myself wear mesh sometimes, but it’s a pain when you can’t wear regular clothes. Sylys Weezles who is a fan of DJ Aurora’s DJ sets had this to say, "She was co-creator of a club that was the second club on a single sim. They shared the sim and co-promoted each other. So, now we have furry clubs lasting for years instead of months. She and Ty had their own club Ari Sen, and they shared a sim with Saros and Ezrin." I agreed with Sylys that her DJ sets are a good way to relax and blow off steam. Aurora is a big fan of video games so I asked what video game character would you be or what video game universe would you want to be in? Aurora Avila: "Not entirely sure... Might have to get back to you on that. Maybe Xenosaga..."
There are lots of bad things to worry about in real life and the daily grind. Aurora’s music DJ sets according to Sylys, "For me, her shows have helped me maintain a positive attitude during some bad times." Aurora has been djing for 5 years and as Sylys pointed out she almost never misses a DJ set. 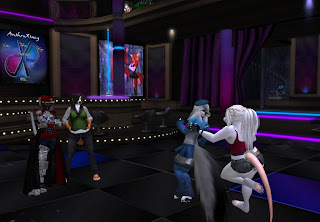 Her DJ set has always been a positive experience here in second life. I also give Aurora credit as I add some of her songs that you can download and hear from OCremixed. Don’t get me wrong I find other songs to play from OCremixed plus other house and trance songs I find too plus my CD collection so I don’t mimic DJ Aurora. However over the years she has been a musical influence. I’d say her music and the community spirit of her DJ sets is certainly a magic potion to restore your hit points and restore your spirits when the real world can be a scary place. DJ Aurora keep playing your tunes! Oh yeah and she does something unique when anyone tips her so watch out when you tip her!